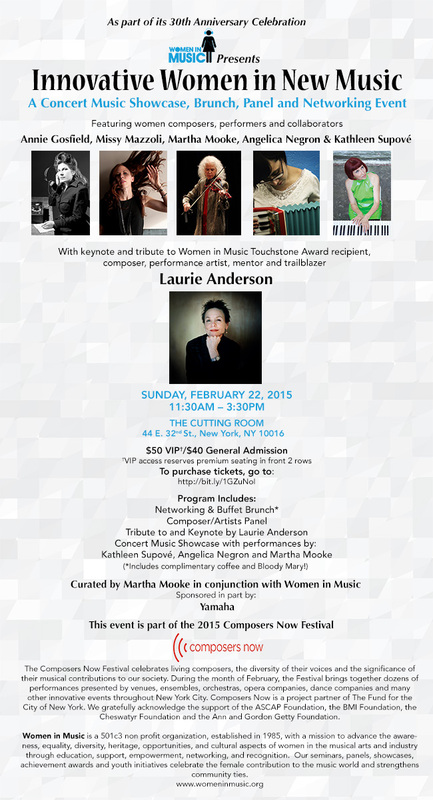 Women in Music presents: Innovative Women in New Music - Featuring women composers, performers and collaborators, with tribute Laurie Anderson. Curated by Martha Mooke in conjunction with Women in Music. ÊPerformances by Martha Mooke, Angelica Negron and Kathleen Supové. Kings County Family Court - Celebrate Black History Month - Brooklyn's Family Court Honors Alvin Singleton. Includes a performance of hisÊMookestueckÊfor five-string electric viola, performed by Martha Mooke, to whom the work is dedicated. 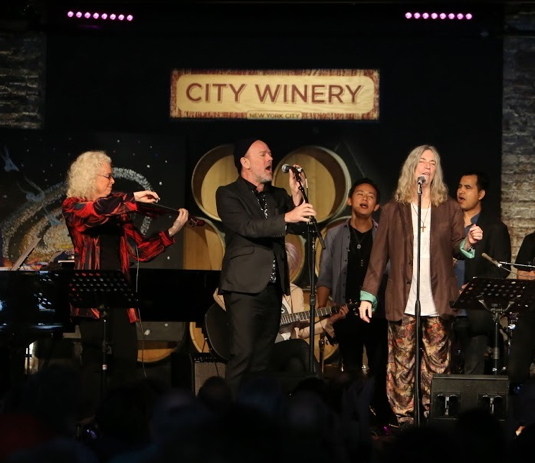 XXV Annual Tibet House Benefit Concert. 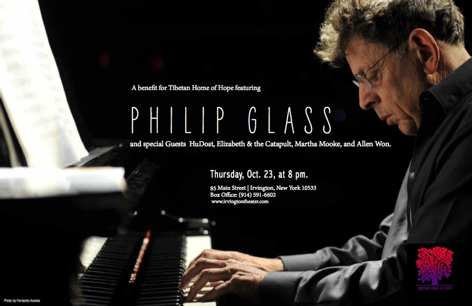 Produced by Philip Glass, featuring Laurie Anderson, the Flaming Lips, Tenzin Choegyal with the Scorchio Quartet. World Premiere of Skandhas for Symphonic Band. Commission and performance by the University of St. Thomas Symphonic Wind Ensemble (Dr. Matthew J. George, Music Director). 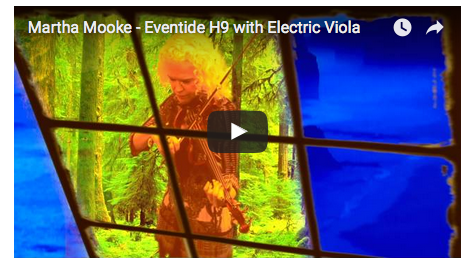 ÊAlso includes performance of Mooke's X-ING for electric viola and concert band and premiere of Virtual Corridors II for electric viola and string orchestra. Presenting "Am I Allowed to Do That?" (Cultivating the Creative Spirit) at the American String Teachers Association National Conference. Make Music Harlem (part of Make Music New York). Performances start at 4pm, Martha Mooke plays at 5pm. 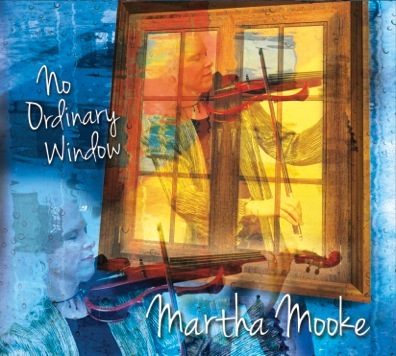 Celebrating the release of cutting edge electro-acoustic violist/composer Martha Mooke's No Ordinary Window CD. Ticket Purchase Includes Brunch, Concert and special "No Ordinary Window" cocktail. "The Power of Strings: Plugging in the Creative Spirit"
Scorchio Quartet w/ Special Guests: Rahzel, Earl Rose and RichardÊSussman. An evening of new works created for Scorchio featuring theÊcomposer performing their music with theÊquartet. Presenting "The Power of Strings: Plugging In!" Presenting "Am I allowed to do that?" 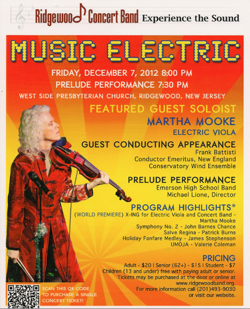 Presenting "Violas on the Verge"
Ridgewood Concert Band; Martha Mooke, electric viola. 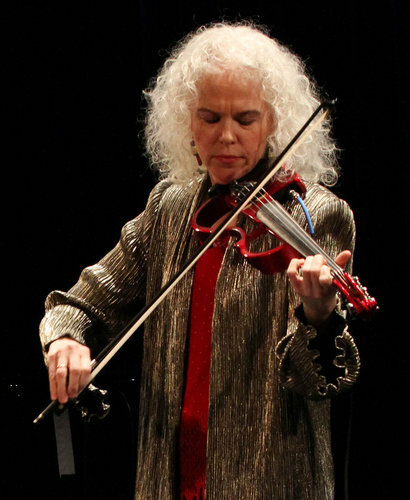 "Renowned electro-acoustic violist Martha Mooke has toured the world with Barbra Streisand and the North American continent with Star Wars in Concert. She has played on Broadway and in Carnegie Hall. She has accompanied a dream team of musicians, among them David Bowie, Tony Bennett, Patti Smith, Andrea Bocelli and Philip Glass. But to this day, the acclaimed musical pioneer respects no one more than her Staten Island music teacher at IS 34, the late Leonard Ogren." Featured Blog: Electric Viola player Martha Mooke shares her experience charting effects in musical scores. Click to read the blog entry: eventideaudio.com/blog/eventide-guest-blogger/martha-mooke-notating-effects-musical-scores. The Arizona Music Educators Association features a new article by Martha Mooke  "Am I Allowed to Do That? Cultivating the Creative Spirit in the Classroom"  in their Spring 2015 issue. The article addresses tapping into the creative muse that each student unknowingly has inside of them, and encouraging young players to venture beyond their respective comfort zones. To read the entire article, visit en.calameo.com/read/001258465fcddf8516157 and use the scroll bar at the bottom to navigate to page 36. 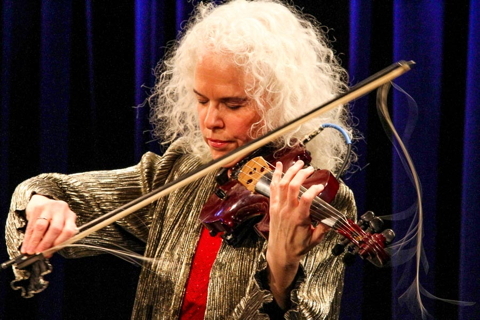 "Acclaimed for her electrifying performances, Yamaha Electric String Artist Martha Mooke has been defying stereotypes and breaking down boundaries throughout her career. X-ING, her debut work for Symphonic Band with electric viola solo, takes that to a new level. Gary Hill and Chris Wilhelm of the Ridgewood Concert Band, co-commissioned X-ING. Hill summarized the experience as follows: "Martha Mooke is one of the most captivating musicians I've ever worked with! At once, she is a superb string pedagogue, an enthralling performer, and a composer in possession of an uncommon voice." "
"When it comes to composers, you're probably familiar with John Williams, author of classic movie themes like Star Wars and Jurassic Park. But how many other composers can you name? Struggling? Well chances are you're not alone. 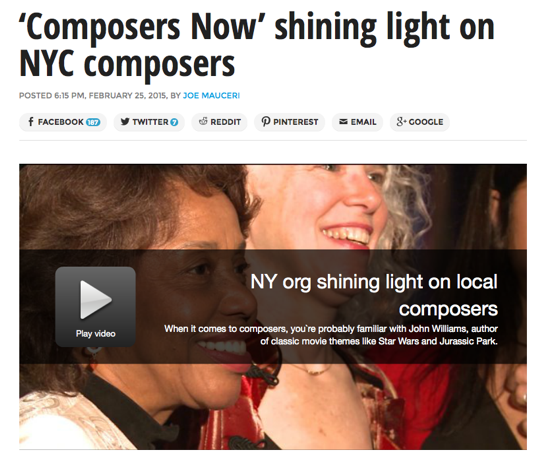 Which is why composer and Brooklyn College Professor Tania Leon formed the group Composers Now...At the Composers Now events, composers like Martha Mooke have the opportunity to meet their audience and discuss the motivation behind their work. Mooke says just knowing that the creator of a work is still living and breathing adds a new dimension to the music for the listener..."
View the segment, and read the entire item. 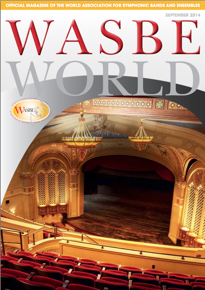 Martha Mooke penned an article for the Official Magazine of the World Association for Symphonic Bands and Ensembles, WASBE World, for its September 2014 issue. The article, in the Focus on New Music section, is entitled "X-ING for 5-string Electric Viola and Concert Band," and includes the composer's own analysis and explanation of the piece. 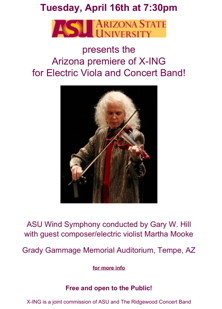 Martha Mooke performs the World Premiere of "X-ING" with the Ridgewood Concert Band, conducted by Frank Battisti, and the Arizona premiere with the ASU Wind Symphony, conducted by Gary W. Hill. The workshops are The Creative Spirit Unleashed, The Power of Strings, and Plugging in the Creative Spirit. For more information and course descriptions, visit the Educator page. Martha Mooke has been elected to the Board of Governors of the New York chapter of The Recording Academy, term beginning in June 2012. Celebrating music through the GRAMMY® Awards for more than 50 years, The Recording Academy is the premier organization for honoring achievements in the recording arts, and supporting the music community. The Ridgewood Concert Band (NJ) and Arizona State University have jointly commissioned Martha Mooke to write X-ING, a work for electric viola and concert band. Ridgewood will premiere the piece in December 2012; Arizona State will premiere it in April 2013. Mooke and Scorchio have been touring with former Blur and Gorillaz frontman Damon Albarn in support of his new CD, "Everyday Robots." 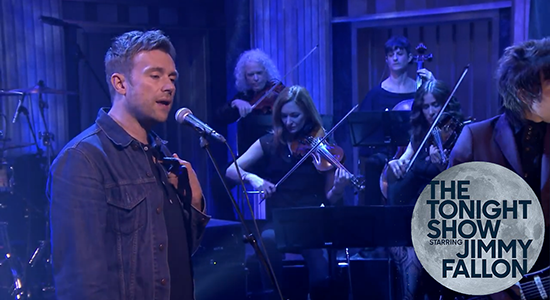 Performances included a June 5 appearance on NBC's The Tonight Show Starring Jimmy Fallon, a performance at WFUV's Bronx studios, and appearances at Bonnaroo and the The Governor's Ball Music Festival. 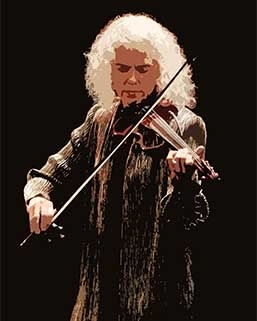 Martha Mooke will present her workshop "The Power of Strings: Plugging in the Creative Spirit," at the 2014 CMS-NAMM Generation Next program, to be held in Anaheim, California, January 23-24, 2014. As a component of the annual NAMM Show, Generation Next is an educational program for college, conservatory, and university music students and faculty that provides an introduction to the NAMM Show, comprised of over 1,400 global music products and materials exhibitors. Mooke will premiere "REM: A Dream in Sound" for electric viola, on Feb. 1, as part of Symphony Space's The Music of Now Marathon. This event kicks off the annual city wide, monthlong Composers Now Festival that celebrates living composers, the diversity of their voices and the significance of their musical contributions to the cultural fabric of our society. On Feb. 24, The Cutting Room presents Scorchio Quartet: The Anti-Room, new music for string quartet with no walls. The Scorchio String Quartet, known for it's artistry, eclectism and collaborations with David Bowie, Lou Reed, Philip Glass, Trey Anastasio and others, brings to life new works by Beatboxing sensation Rahzel, electric tinged jazz pianist/composer Richard Sussman, Emmy Award-winning composer Earl Rose and Scorchio founder/electro-acoustic violist Martha Mooke. The Scorchio Quartet is a collaborating partner of the 2014 Composers Now Festival. The inaugural concert by students at Kaufman Music Center's new Special Music School High School on November 21, 2013 included world premieres of works by Martha Mooke, commissioned by Composers & Schools in Concert and part of SMS High School's fall 2013 composer residency. 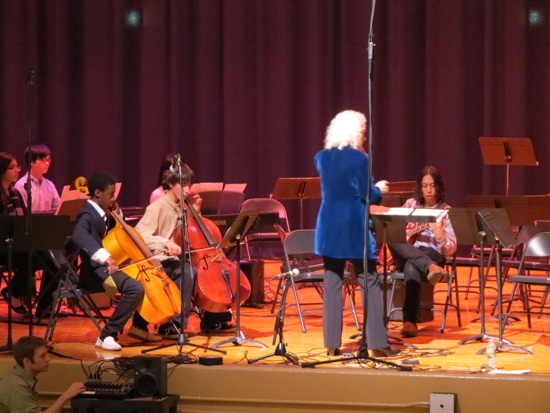 American String Teachers Association: Kudos to Martha Mooke!